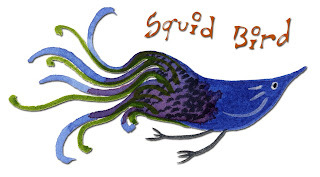 Looks like a squid, but is really a bird! I love all of your art! I've looked through your blog and enjoyed all the photographs and artwork! Wonderful stuff. I saw through your eyes! I lived in Evanston for only a summer when I was a high school student in the theater program at Northwestern. I loved that city and never wanted to leave! I played the part of a Russian opera singer named Darushka in a play entitled, "Claudia," and to this day I remember every single detail of that experience...it was so awesome. That is truly very funny! You have quite the sense of humor! Thanks for entering my tatting giveaway for OWOH! Good luck to you.